After they were dipped in chocolate, these orange truffles were rolled across a cooling rack to give them spikes reminiscent of chef Anne Burrell’s hair. I chose Orange Truffles for the first recipe to try in Peter Greweling’s book Chocolates and Confections: Formula, theory and technique for the artisan chocolatier for two reasons: one, they were truffles and therefore within my comfort zone (in theory), and, two, I had plenty of Grand Marnier on hand. English toffee is rather easy to make — I based my cashew-loaded version on Carole Bloom’s recipe, but most recipes I’ve found use near-identical formulas. 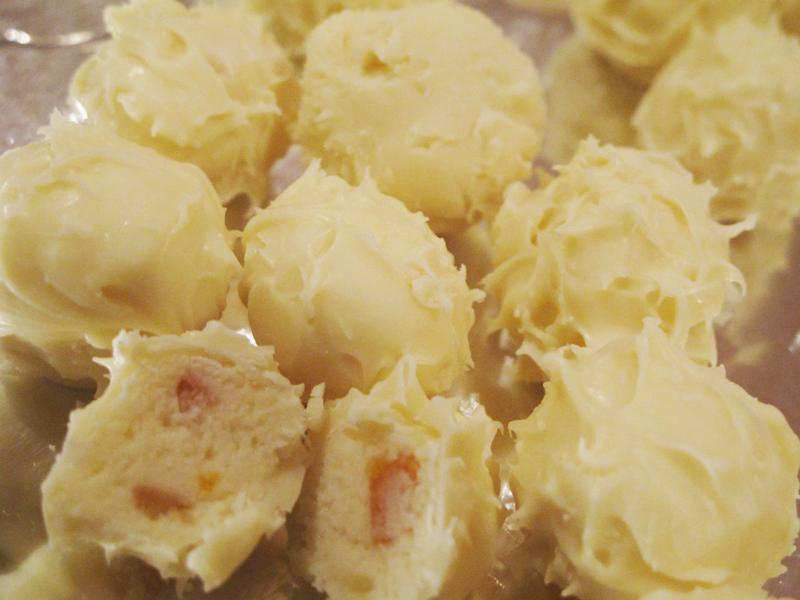 Bloom instructs us to roll the dipped toffee in chopped nuts, coating the piece entirely. I found that to be overkill and decided to have just one side covered with nuts, with a cashew half garnishing the top. 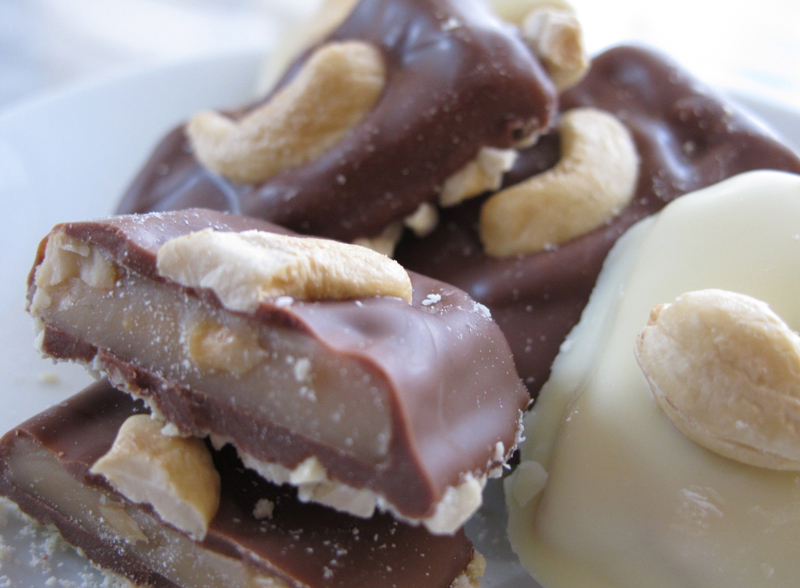 To get the chopped cashews on just one side of the dipped toffee, have a shallow pan filled with toasted chopped cashews (about two to three cups worth) ready to go before tempering the chocolate. Place each freshly dipped toffee piece onto the cashews, gently press a whole cashew onto the top (using this pressure to also press the toffee into the cashew pieces), and let each piece sit until the chocolate is set enough for you to safely move them to another pan. As you take the set toffee pieces off the pan, redistribute the remaining chopped cashews to ensure all subsequent pieces also get a nicely cashewed bottom. 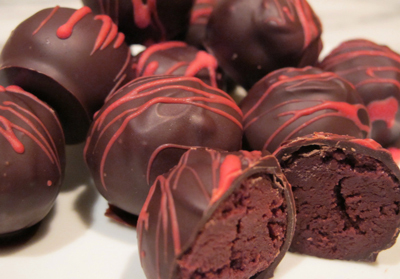 The Carole Bloom recipe I used is from her book Truffles, Candies, and Confections, Ten Speed Press, 2004, p.156-157. 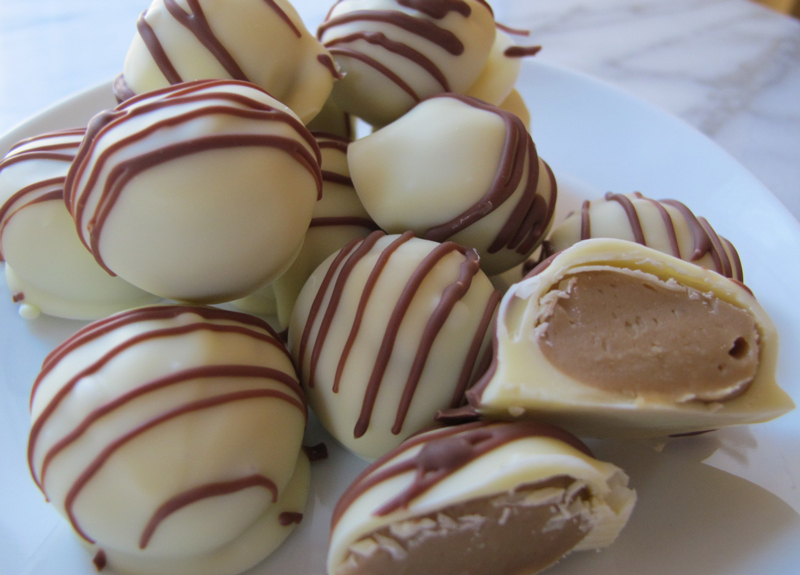 Unable to find a trustworthy cappuccino truffle recipe with a white-chocolate-based ganache (I was trying to please both a coffee lover and a chocolate hater), I decided to adapt truffle goddess Carole Bloom’s cappuccino truffles recipe, which in its original form has a dark-chocolate ganache base. One of the confection cookbooks I’ve had great success with so far is Carole Bloom’s Truffles, Candies, & Confections, especially when it comes to truffles. I’ve tried her milk chocolate truffles, mocha truffles, and chocolate raspberry truffles — all of which yielded truffles of perfect flavor and texture — and adapted her cappuccino truffles for a white-chocolate ganache. Kudos to her for her carefully written, thorough instructions as well. When I made Bloom’s already-fabulous chocolate-raspberry truffle recipe for the second time, I upped the amount of raspberries slightly, both for convenience — 12-ounce packages of frozen raspberries were easy to find in my area — and for a little extra raspberry zip. I also changed the procedure slightly, adding the step of an initial hand dipping with untempered chocolate. And I upped the amount of chocolate required for dipping and used a colored-white-chocolate drizzle for garnish instead of her originally prescribed cocoa powder.